I wanted to blog the recipe for fresh tuvar (lilva)kachori yesterday, but could not do so because of internet problems. Yesterday was Father’s day and I made some yummy fresh tuvar (pigeon peas) kachori as my dad simply loves farsan (indian hot snacks). Tuvar is very much in season and though my dad is not in Mombasa, I still made them with him in mind. He gets the virtual ones and we get to eat the real ones. Father’s day was a bit emotional for Ajay and me. We miss dada a lot, my dad is so far away, and our kids wished Ajay, but they too are far away. Its at times like this we tend to miss our family so much. Skyping, calling and emails have made communication so much easier but we still miss the hugs and kisses and blessings. So definitely the hot, hot kachoris was like comfort food for us. And watching Jab tak hai Jaan on dvd was even more comforting. Add the water and form a dough that is not too soft or too hard. Don’t knead the dough too much. Cover the dough with a damp cloth and leave it on the side till required. Coarsely mince the pigeon peas in a food processor. When the oil is hot, add mustard and cumin seeds. When it begins to sizzle, add hing and turmeric powder. Add the grated potato immediately. Mix well. Lower the heat and stir fry the potato for about 2 minutes. Add the minced tuvar. Mix well. Cover the pan and let the vegetable cook for about 3 to 4 minutes over very low heat. Take the pan off the heat. Add ginger, chilli, salt and sugar. Mix well. When the mixture cools down a bit, add coconut, fresh coriander, lemon juice, dhana jiru,cinnamon and clove powder. Mix it well. Divide the dough into 24 parts and roll each part into a ball. Roll the one part into a circle, about 3 inches in diameter. Place the filling ball in the middle of the circle. Gather up the edges to the middle. Pinch the edges together. The kachori at this stage will resemble a money bag. Remove any excess dough from the top by pinching it up. Roll the kachori gently into a proper round shape and place it on a greased tray. Continue steps 3 to 4 with the remaining filling and dough. Heat the oil in a deep pan, wok or karai over medium heat. Drop a tiny piece of the dough into the hot oil. If it comes up immediately the oil is ready. Half fry 6 to 8 kachoris at a time lightly. Remove them with a slotted spoon or jara. Just before serving, heat the oil up again over medium flame. Fry the half fried kachoris again over low heat till they are golden brown. Serve with a delicious chutney. 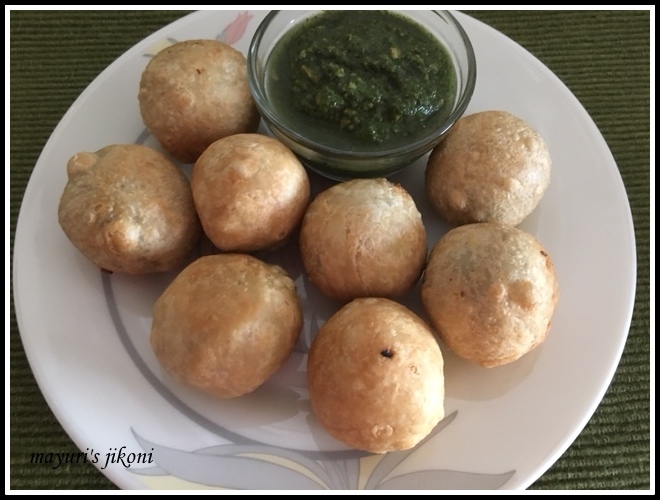 If there is any dough left over, which there will be if you remove the extra dough while preparing the kachoris, roll them out into a circle and fry them. They taste good with a cup of masala tea. Prepare the half fried kachoris a day ahead and store them in a container in the fridge. Layer the kachoris on kitchen towel or foil in the container. Cover and refrigerate. Don’t overcook the tuvar otherwise the filling will taste dry. I prefer not to overpower the filling with spices as I prefer to get the taste of the vegetables. While preparing the kachoris, keep them under a damp cloth so that the dough does not become dry. If the dough sticks to your rolling pin or board, smear them with a bit of oil. Remember to remove as much excess dough as you can otherwise the kachori will taste of raw dough on one side.